Earlier this year we held a beautiful wedding at The Venue and recently Bride announced it as their wedding of the week! Gilly and Adam only had 12 weeks to book their wedding but they pulled it out of the bag! Focusing on key elements such as floristry and stationery, the day had a “Dior Chic” look – stylish, simple and sophisticated. Gilly asked family members to help with the stationery and it really paid off, a navy colour scheme with touches of bling and an abundance of white flowers really set the scene at The Venue. Despite the whirl wind planning, Gilly enjoyed every minute. The couple’s favourite part of the wedding day was surprising the guests – many of them hadn’t been to the Royal Liver Building before so they didn’t know what to expect, and assumed because of the Grade I listed building it would be very traditionally decorated. The Venue is a complete contrast. 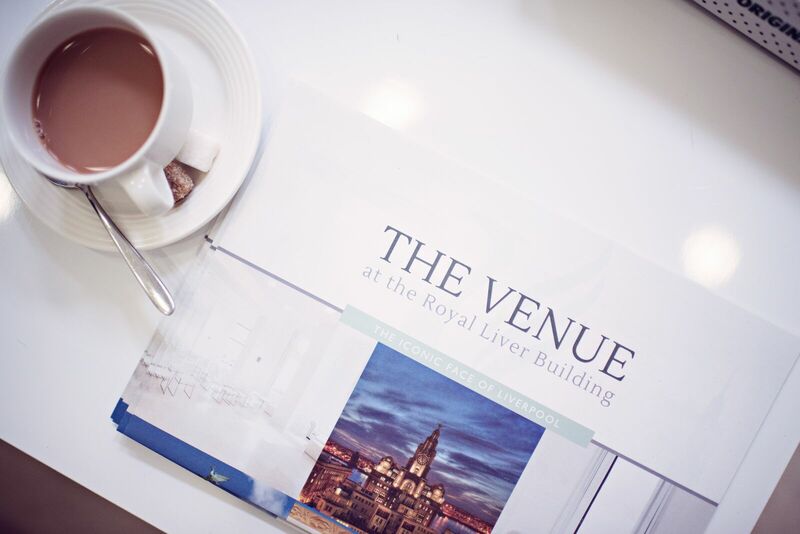 With white walls and huge windows overlooking the Mersey, The Venue is a modern blank canvas which can suit any couple’s plans. The weather was also perfect for the couple’s big day. Gilly and Adam hosted their drinks reception on the balcony, with an added bonus of a cruise ship docking! Doughtery & Allen delivered incredible catering and wowed guests with a stunning three course meal, as well as impeccable service. You can read the full article on Bride. For more information about getting married at The Venue, have a look at our wedding page, email or call us on 0151 559 1950.